A couple of weeks ago I decided to have an end-of-summer dinner party with a group of friends. Last year, one of my neighbors crafted a gorgeous redwood patio table for me that can seat 10 and it's become the perfect gathering place for an evening of food and drink and good conversation. By mid-week before the dinner, though, I realized I'd be up against it. Hot and humid August had morphed into equally sweltering weather in September. It lifted briefly with a brush with cool air and even a touch of rain. But the forecast for my dinner party weekend had temperatures charging over 100 degrees. My menu, which included baking Melissa Clark's plum polenta upside down cake, had to be tossed in favor of something that gave simultaneous hints of the waning summer and imminent autumn, but without the kind of cooking that would have me sweltering in the kitchen and my guests recoiling from traditional cool-weather comfort food. You'd think grilling would be a natural to get out of the kitchen, but would you want to be the person standing over the barbecue in, let's be generous and say 90-degree heat at 6 p.m.? I didn't think so. So, roast chicken it would be. Misery would be contained in the kitchen for just an hour or so. The rest would be easy and could be put together over a couple of days. A tomato, cucumber, and feta salad would say so long to summer, while a quinoa salad with fresh figs and toasted pine nuts would beckon fall. In fact, plead for fall. Dessert? Forget baking; I'd get in touch with my friend, the ace baker Rachel Caygill, who among other things makes ice cream sandwiches for places like Carnitas Snack Shack, and ask her if she had a spare dozen or so to spare. I'd get fruit and make a fruit platter to accompany them. Done. 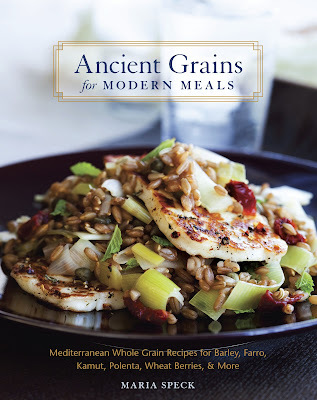 Except that when I started perusing some cookbooks for ideas on ways to ignite the quinoa salad I came upon Maria Speck's recipe for Barley Salad with Figs and Tarragon-Lemon Dressing in her wonderful 2011 book Ancient Grains for Modern Meals. Barley has more heft than quinoa and would be a welcome change in salad form from the cliche that is becoming quinoa (substitute the word quinoa with arugula and you know what I mean). Figs were already part of my game plan and I grow Mexican tarragon and lemons in my garden. She calls for dried figs in her recipe, which makes sense for other parts of the country and seasons other than late summer, but in San Diego, figs are now in high season and plentiful. I wanted to take advantage of that. Her recipe also calls for apples, but, remember those high temps? I was still in summer mode and opted against them and added the planned toasted pine nuts. It's these little changes that are part of the fun of making a recipe your own and I know Maria won't mind the alterations. Well, Friday and Saturday temps broke records and soared to well over 100 degrees (my garden's last tomatoes literally cooked on the vine) but fortunately by Saturday evening the air was becoming comfortable and even balmy. The menu morphed into the perfect summer meal and the barley salad was a surprise hit (along with my friend Julie's refreshing Micheladas and Rachel's butterscotch ice cream sandwiches). Barley, it turns out, is much more versatile than home cooks give it credit for. Yes, it's the perfect addition to make a winter soup truly hearty, but it is equally delicious as the basis for a whole grain salad. The large grains and chewy texture work well with a variety of fresh, crunchy vegetables, with nuts, and with fruit--dried or fresh. And for those of us with Type 2 diabetes, it's one of the best grains to consume because of its low glycemic index. Here's my adaptation of Maria's recipe. You can add 1/2 cup chopped tangy apple, such as a Macintosh or Granny Smith. In the future, I'd also consider adding fresh Asian pears, champagne grapes, Maria's dried figs or other types of dried fruit to the salad and even other nuts (think toasted chopped pecans). As I said, make it your own. Prepare the barley by combining all the barley ingredients in a 2-quart saucepan and bringing the mixture to a boil. Reduce the heat to simmer and cover the pot, cooking until the barley is just tender--30 to 40 minutes. Remove from heat and let stand, covered, for 5 to 10 minutes. Drain any remaining liquid and transfer the barley to a large bowl to cool. Remove the zest and peppercorns. You can do this a day or even a few days in advance and keep the cooled cooked barley in the refrigerator until you make the salad. At that point, take it out of the fridge an hour or so before you make the salad to bring it to room temperature and then stir it up or break clumps up with your fingers to separate the grains. To make the dressing, finely grate the zest of the lemon to get 2 teaspoons zest. Squeeze the lemon to get one or two tablespoons of juice. In a small bowl whisk together the olive oil, lemon juice, zest, and honey. Season with the salt and pepper. Stir in 1 tablespoon each of the tarragon and parsley. In a large bowl, add the barley, figs, celery, green onion, pine nuts, and fig slices. Mix well, then add dressing and toss to combine. Let sit at room temperature for 15 minutes to allow the flavors to mingle. Toss again and sprinkle with the remaining herbs. Serve. This sounds incredible! We have some figs on our trees, can't wait to try this. I need to buy this book. Having been lucky enough to partake, I'll attest that it was a wonderful salad, and evening, and ice cream sandwiches, and company... Thank you Caron! Oh, those ice cream sandwiches! Thanks, Catt! So glad you and Jerome were there! Time Again to Celebrate the Craft!